Google My Business verification is now instant. According to an announcement on their forums, from today you can now instantly verify your business listing if you’ve already verified your business website with Google Webmaster Tools. Good news — starting today, if you’re verifying a page for your business, you may be instantly verified on Google My Business if you’ve already verified your business’s website with Google Webmaster Tools. The verification will happen automatically, if applicable, when you attempt to verify a page for your business. Not all businesses with websites verified using Google Webmaster Tools will have instant verification, since not all business categories are eligible. If that’s the case, please use one of our other methods of verification (https://support.google.com/business/answer/2911778). In the past verification had to be done via a Postcard. You created your business listing, entered your business address and Google would send you a Postcard in the post with a PIN number that you entered to verify you are where you said you were. Now this can all be achieved instantly if you have already verified your business’s website with Google Webmaster Tools and if you haven’t, shame on you as it it’s a very powerful tool for all Webmasters. How do I verify my Google My Business page? Google Authorship and rel=”author” – You’ve probably heard about it right? They do it by linking their Google Authorship in Google+ to their content on their website. This is called a “rich snippet” and is set to be huge in terms of Search Engine Results. And here’s the killer. Because it stands out, users are more likely to click on it. In fact, some companies have seen a 150% increase in click through rate since implementing Google Authorship and that’s a figure you’d be daft to ignore. Well, sit back and relax as we are going to run you through the basics of what Google Authorship is, how to link your Google+ account to your blog and how to use rel=”author”. 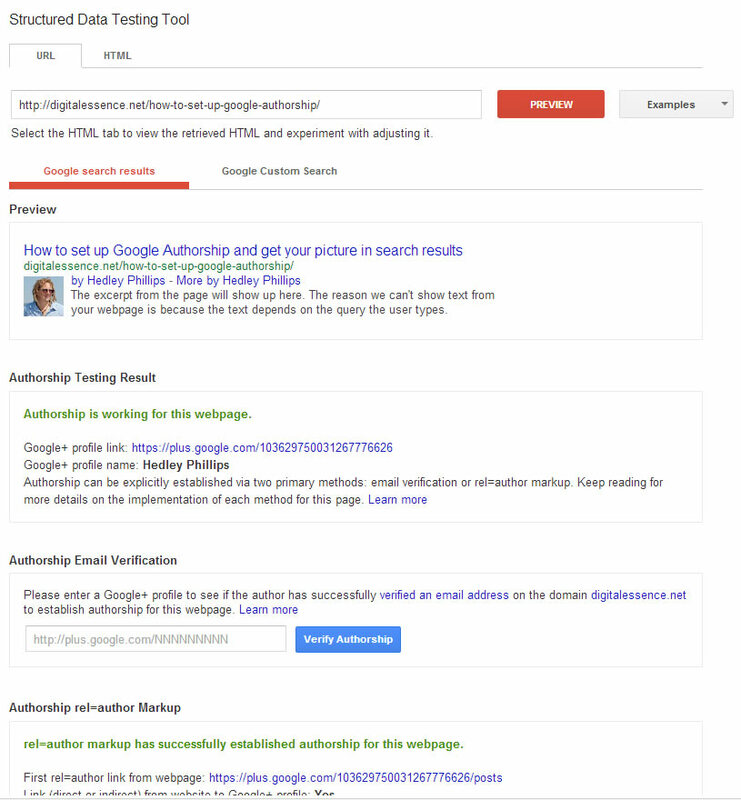 Google Authorship is a way to link content you create on your or others websites and blogs with your Google+ profile using a rel=”author” tag. You become the author whether you post on your site or another blog. It allows you to extend your credibility to your content and is amazingly powerful. Content is King and Google loves good quality content. Authors of good quality content who generate traffic and social buzz will develop an Author Ranking which will give a boost to all the content they write. Note Author Ranking is not the same as Google Authorship. Author Ranking is where, over time you build up a ranking as an expert in your industry who writes good quality, relevant content that people read and link to. Your company shouldn’t be a faceless corporation and customers love to deal with real people and your website or blog shouldn’t be any different. Google Authorship allows you, the person to be the author and as time goes on and as you continue to write good quality content, you may become an industry expert. Ok… enough already, you’re sold! Why don’t we just get on and tell you how to add Google Authorship to your page…. Your first step is to create a Google+ profile. We hear lots of people saying “We don’t get Google+” or “it’s useless, there’s nobody there” but we love it. Ok it isn’t Facebook but it isn’t trying to be. The key to Google+ is to join communities related to your interests. For example we belong to and contribute to several communities related to WordPress, Genesis Framework, PHP and Search Engine Optimisation and it is now our go source for tips, hints and answers when we are stuck. Anyway, we digress. Let’s move on to setting up a Google+ profile. How do I set up Google+ page? The first step is to join Google+. If you have an existing Google account (Gmail, Google docs, Google Webmaster Tools, etc) then you already have a basic stub account you can use. Browse to https://profiles.google.com/ login with your username and password. If you don’t have an account you can create one. If you can, make sure to use an email address on the same domain as your website or blog. It makes the whole process much easier. For example for us our website domain is digitalessence.net so we would use an email like our_name@digitalessence.net. Don’t have an email address on the same domain? 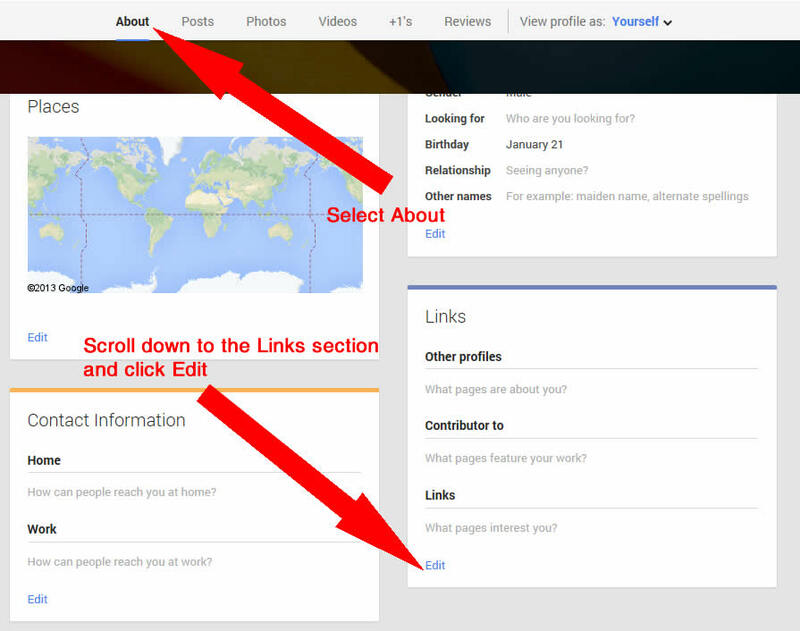 Use this link to link your content to your Google+ profile and select Option 2. When prompted, upload a clear facial headshot for your profile. Don’t use art, cartoons etc. make sure your image is at least 250×250 pixels or it will fail the upload. In the meantime, Google will have sent you a verification email. Make sure you click the link in this email and verify your account so that Google knows you are legitimate. Now you have your page set up it’s time to set up your Google Authorship. On the left hand side of the Google+ page, hover over the Home > icon under the Google+ logo and your dashboard will slide out. Select Profile. You are now set up as a Contributor to that website. If you write for more than one site/blog then add the other url’s in here as well as you can be a contributor for many sites. NOTE: Don’t use this ID, it is ours and will add us as a contributor to your site! Keep this safe for now as we are going to use this in a Meta data tag on your site. You can optionally complete all the other sections of your Google+ profile to include your location, occupation and other information. While these details aren’t required for Google Authorship, we are sure they add some credence to your reputation. Now we move on to your website. The methods for adding the next step depends on the type of website you have. Firstly, make sure you have an author mentioned on your site. Something like “Written By…” and then your name. If you are using WordPress this is added automatically. The name in your byline should match the your Google+ name exactly. If you have a hyphen in your Google+ name then use it in your website byline. Make sure the names are identical! Open up your website html files in your favourite text editor and search for the <head> tag. You want to place the code between the opening <head> and closing </head> tags. There will more than likely already be a few other meta tags there so just pop it in. Anywhere between the two head tags is good. Substituting your Google+ url and ID for ours. Please do make sure you enter your 21 digit ID and not ours or it won’t work! Here’s an example of our rel=author code in place. If you are using WordPress with the Genesis Framework then as with most things, this is going to be very easy to do! Just add your Google+ url to your user profile in WordPress by clicking on Users > Your profile, scroll down to Contact Info > Google+ and past the full url into the text box and press save. Simples. But that’s why we use Genesis and you should too. To confirm this has worked you can view the source of an individual post or page and look for the rel=”author” tag and it should show as per the example code above. Ok, so you’ve worked your way through all of these steps and we know you are itching to see if it works but please be patient. You will not see your avatar or image showing up in the Google search results for at least a couple of days. But don’t despair, there is a way you can test all your hard work and make sure that at least your Google Authorship set up and rel=”author” tag are correct. Thankfully, Google have provided a handy tool to do the checking for you and it’s called the Structured Data Testing Tool. Once this is all set up you will see your profile headshot, name and number of Google+ circles you appear in alongside all of your search results. Give Google at least a couple of days to show this in the search results as it’s not instant. But if you have followed our instructions and have tested everything with the Google Structured Data Testing Tool then you will show up. Ok, so you have been through our post and it just isn’t working for you and you are scratching your head wondering where you went wrong. Have you connected your content to Google+ by adding the rel=author tag? 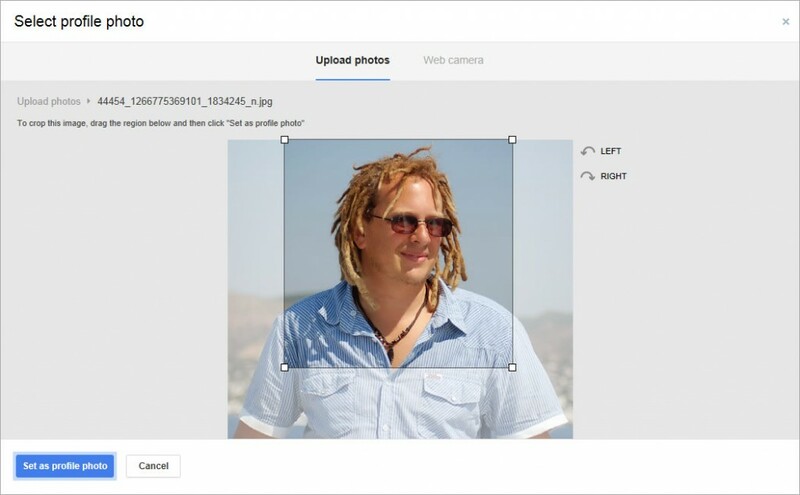 Is your Google+ profile set to public? Have you tested your page in the Google Tool? * Confirming your email address is just an alternate verification method, and only works for sites on which you have a domain email address. If all your answers are yes then you are all set up and you just need to wait a few days for Google to pick up on the changes. If you’ve found this article useful please consider giving us a Share, Tweet, +1 or Like. The more our content gets shared the more we can help people get Google Authorship set up on their website. Blogging involves not just writing good copy but also using good imagery. Photos are a great way to engage people on your blog. They also catch attention when people share your post on Facebook or other social media platforms. This is all very well but good photography doesn’t come cheap and if you are paying for images from Royalty free sites like fotolia.com then it can quickly add up. Photos are a great way to engage people on your blog and draw them into your post. They also grab attention when someone shares your blog post on Facebook or another social media channel. Unfortunately, good photography can cost a lot of money, and with regular blogging, the investment can add up fast. Enter Compfight. Compfight searches Flickr’s photos that have the appropriate Creative Commons license for Commercial Use and even provides you with the HTML code for proper attribution. There’s a good FAQ guide and link to the Flickr Creative Commons licence page so you can fully understand how the licences work and what your rights are and how to use the images. Do you use them? We do and we find them essential for not only keeping up to date with our industry but also provifing quality content for our Social Media fans & followers. News Feeds (Aggregators) basically allow you to add websites, Blogs & RSS feeds to your account so that any new content published shows up in your feed. You can quickly scan through the summary and if you find it interesting, click on it and read more. 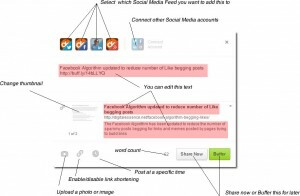 Social Media schedulers like Buffer allow you add photos, posts and links to a queue and then schedule them to Social Media platforms like Facebook, Google, LinkedIn & Twitter. 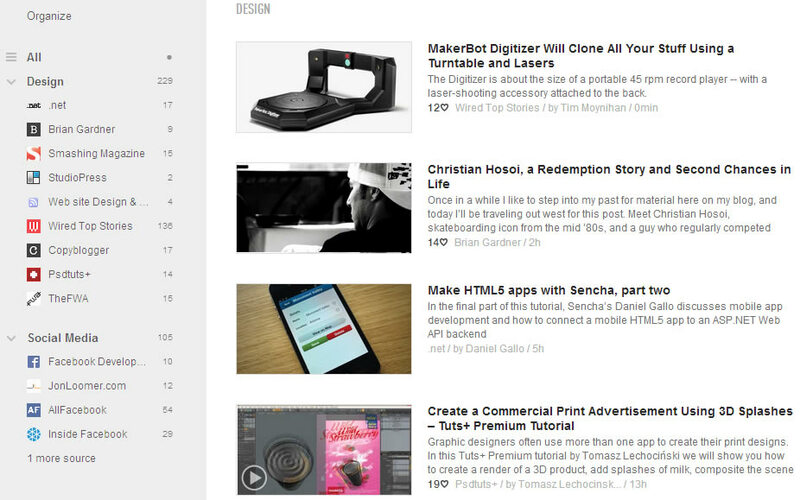 We use Feedly & Buffer. Since the demise of Google Reader, the most popular news feed aggregator out there, we’ve been looking for a suitable alternative and we think we’ve found it. 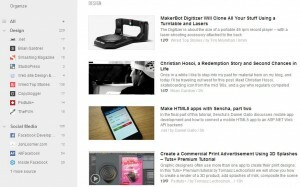 Feedly allows you to easily search for and add news feeds from Blogs, Websites & RSS feeds. So what’s so great about it? Well, firstly it’s free and secondly, it’s so simple to sign up for and use it shouldn’t take you more than 10 minutes to be up and running and thirdly it’s brilliant. You can easily search for keywords, #hashtags, @usernames or specific website or Blog names so it won’t take you long to build a stack of good quality, relevant feeds of interest to both you and your users. You can group the feeds under topics to organise them according to the subject type, for example we have Design, Social Media & Tech and then browse all of the feeds, by group or individually. Clicking on a feed will bring up the full article including images and if you then want to read it on the original page, click the title again and it will take you that site. It’s all pretty self explanatory so we won’t go into great detail on how and what to do. Suffice to say that if you want a good quality browser based app that automatically feeds you stories and articles from your favourite sites then Feedly is the one for you. Now, we are totally in love with Buffer, even more so since they added Google+ pages to their list of feeds yesterday. It is so easy to use, does what it says on the tin and the support is just superb and all this from an app that is free (you can pay to “go awesome” if you want extra features and queue storage and we are tempted). Buffer works best if you install the browser extension. We use Chrome so this was an easy process and it gives you a Buffer icon in the top right of your browser. If you’re not using Chrome as your Web browser we highly recommend you do You can download Chrome here. Once you find a news item, post, image or tweet you want to share, either via Feedly or while browsing the web, Twitter, Facebook or pretty much anywhere. Click the Buffer icon and up pops a screen allowing you to edit the post and then either post now to your chosen feeds or Buffer it which adds it to your buffer queue. Click image to see a larger annotated version. 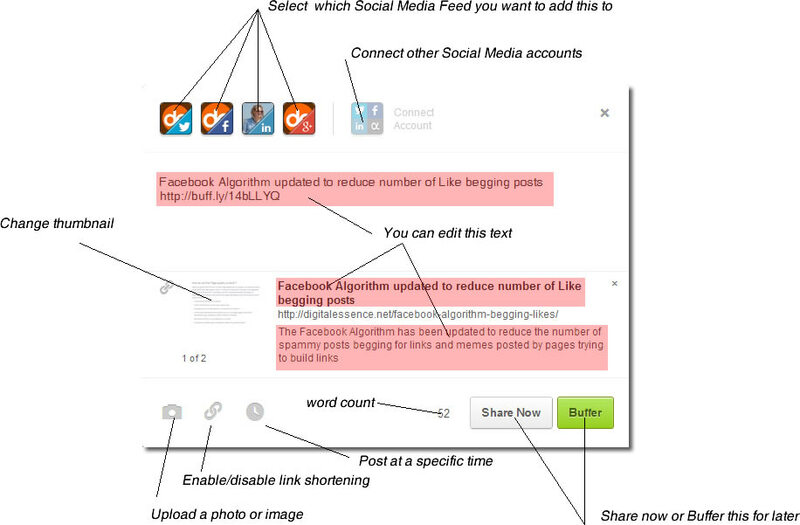 Your Buffer queue can have multiple posting schedules for each feed. So for instance you have Twitter posting 3 times a day and Facebook just the once. Choosing the time to post is easy using a drop down menu and halting the queue is as simple as clicking on each of the days so they go green. It really is very simple to use.